Practical guidance for advisors and their older clients and their families on the issue of dealing with cognitive decline and its impact on investment planning and decision-making. Editor’s note: We are pleased to present part II of an abbreviated version of State Street Global Advisors’ excellent white paper, “The Impact of Aging on Financial Decisions.” Part II identifies proactive measures for advisors to help protect their clients and better understand the connection between money mistakes and cognitive decline to minimize age-associated financial vulnerability. Part I discusses the risks of age-related issues and provides insights on how investors and advisors believe cognitive decline and the aging process relate to investing attitudes and behaviors. Proactive Advisor Magazine is dedicated to promoting and educating the advisor community on active investment management. Yet, we also recognize that, as important as the benefits of dynamic, risk-managed investing are to our audience, successful advisors also need to take a holistic view of risk management across all aspects of their clients’ lives and the lives of their families. We greatly appreciate the opportunity to republish this white paper and hope you find it of value for your practice and your clients. Research among individual investors reveals an overall lack of concern and planning. Only about 39% of investors report that they believe they have a suitable plan for if and when their decision-making becomes diminished. What is preventing the other six out of 10 investors from developing a plan to manage the financial risks associated with cognitive decline? Some investors simply may not be aware of the potential impact of cognitive decline, including how prevalent it is, how it affects financial decision-making, and at what age it is likely to occur. That may be especially true for younger investors. 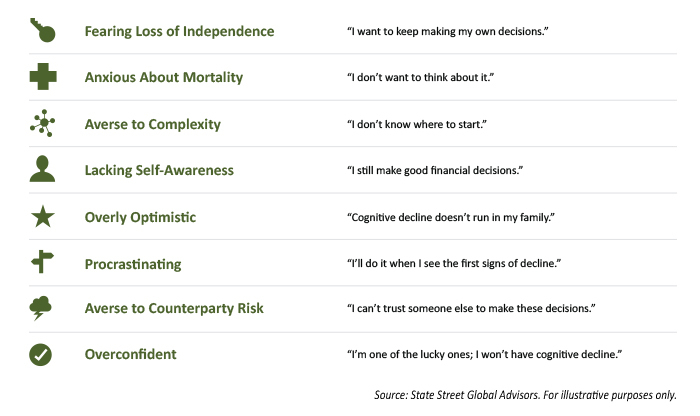 For most investors, however, there is psychological resistance to planning for cognitive decline, triggered by personal and potentially deep-seated issues, such as a fear of losing independence. The fundamental problem is that avoiding the issue only increases risk for both the investor and their advisor. Investors who live a long life will almost certainly experience some form of cognitive decline, and they probably won’t be aware of when it’s starting. When they do begin to experience cognitive decline, investors are often overconfident in their financial decision-making abilities, possibly because the decline tends to be gradual. They are less likely to perceive the need to make a change. There is a clear need for strategies and protocols that formalize the planning process to be adopted across the industry. Taking this comprehensive view, we see three dimensions to addressing the challenges of planning for cognitive decline from a broad industry perspective. First, there is a disconnect between the investor and their advisor. Second, there is a pattern of avoidance. Finally, there is significant risk of inaction. 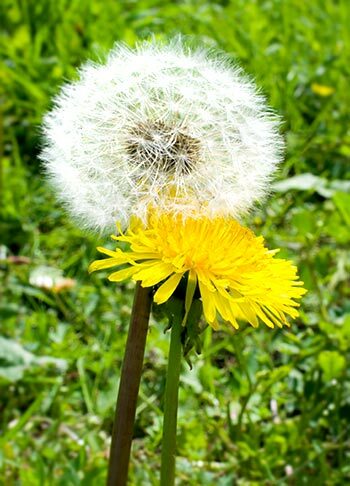 The disconnect between investors and advisors seems to be a problem of perception. Advisors say that it is the investors’ refusal to recognize the onset of cognitive decline that is preventing conversations about diminished capacity. On the other hand, investors report that their fear of losing independence is blocking them from action. This disconnect is a perpetual barrier to communication. Experience proves this to be true. According to a recent State Street Global Advisors survey, 85% of advisors say they encourage their clients to have a plan in case of cognitive decline, while only 41% of investors think they need a plan. The majority of investors believe that they will be able to make changes even after they start to experience symptoms of diminished capacity. The situation can deteriorate quickly when conversations are deferred, as not all advisors—especially those who don’t have a client experiencing cognitive decline—know the signs of diminished financial decision-making capacity. Not surprisingly, we see roughly the same result when it comes to talking with family members: 91% of advisors agree that their clients need to talk more with their families about the potential impact of aging on financial decision-making, but only 46% of investors agree that they need to do so. There is an even greater disconnect when it comes to the level of support provided. As reported in the same State Street Global Advisors survey, while 72% of advisors say that they provide clients with sufficient information and support regarding the potential impact of aging on their financial decision-making, only 27% of investors are satisfied with the level of information and support provided. The silver lining here is it appears that investors want to be more fully informed, which is an opportunity for a behavioral shift. Question asked: Which of the following do you agree with? / Please indicate if you agree or disagree with the following statements. For many investors, fear and uncertainty are preventing them from discussing the possibility of cognitive decline and developing a plan. It’s not just investors who are avoiding the reality of cognitive decline. Advisors may also be apprehensive about initiating the conversation early on or confronting their clients who have started to present symptoms. More often than not (54%), advisors will contact their client’s spouse or partner rather than talk with the client directly. Lack of a plan can also lead to conflict among adult children. The onus may fall on the advisor to bridge generation gaps and to resolve any escalating power struggles among parents and adult children. All of this makes clear that, even though this may be a difficult conversation to have when a client is still operating at their full cognitive abilities, it can only get more difficult after the client starts to experience cognitive decline. At that point, the options are also more limited and more burdensome for both the advisor and the investor’s family. When adult children step in to help their parents manage family finances and investments, it’s typically triggered by some event that overwhelmed or confused the parent. The added stress from these unexpected situations makes the whole transition much more anxiety-provoking than it needs to be. Many adult children with parents who have been through this difficult situation have been able to learn from it and are already focused on minimizing the stress on their own children. This family history can have a positive impact: 49% of individuals with a family history of cognitive decline have discussed plans for cognitive decline with other family members, compared with 24% of those with no history. The third dimension brings to light the real consequences of not planning ahead. Investors risk making poor financial decisions or having financial decisions made in a way that doesn’t reflect their preferences. That may include some of the most complicated financial decisions, which are faced later in life during the decumulation phase of retirement planning; any deterioration of the investment portfolio at this point due to poor decisions probably cannot be recouped. Worse yet, investors who are experiencing cognitive decline are especially vulnerable to fraud, which can have a devastating effect on their quality of life. Family members often aren’t aware that their loved ones are being swindled. Sometimes, the investors themselves are unaware of what’s going on or are too embarrassed about the scam to ask for help. Sadly, some family members may also try to take advantage. Family dysfunction is a common fallout from the added stress that comes when adult children suddenly have to provide care and oversight but may not have the time or resources. All of this increases the risk of expensive and time-consuming legal actions. It’s painfully ironic that investors who avoid planning for cognitive decline because they fear losing independence actually put themselves more at risk of losing control over their assets. Advisors, on the other hand, are in a “damned if I do, damned if I don’t” situation when they have a client who begins to show signs of cognitive decline but does not have a plan in place. They face legal risks if they take orders from a client who has diminished capacity; they face potential loss of business if they don’t. When the investor starts to experience cognitive decline without having established a plan for their financial decisions, there can be an emotional backlash against the advisor. Even in situations that are ultimately successful, the advisor is likely to put in considerably more time and effort to implement a plan retroactively. Advisors can help clients clear these hurdles by developing a holistic financial plan that takes into account the potential for cognitive decline. Addressing the risks of cognitive decline early on and before the onset of any symptoms enables the advisor to neutralize what could have become a sensitive topic that’s difficult to discuss. From the client’s perspective, the advisor is providing an important additional level of risk management. Uphold the firm’s fiduciary responsibility. Ensure continued relevancy with future generations. Each advisor and each firm should develop their own approach that can be tailored to the client’s specific situation. This might include standard documents, such as durable power of attorney, and firm-specific documents, such as a diminished-capacity letter. What’s most important is for the firm to provide the necessary resources and protocols to support advisors and their clients. Investors who are aware of the realities of cognitive decline can protect themselves and their families. While it is the advisor’s professional responsibility to help clients prepare for uncertainty in the future, clients also shoulder some responsibility, at the least having up-to-date directives on file with their advisor and also keeping copies in a safe place that is known and accessible to key family members. That could mean putting the documents in a safe deposit box or keeping them on file with an attorney or an accountant. A good place to start this process is during the on-boarding process for new clients and as part of a regular account review for existing clients. Firms with simple and straightforward policies and procedures for advisors to initiate dialogue around these documents are models of best practices. Besides specific documentation, advisors and their firms should consider guidelines that go beyond the standard estate-planning protocols. For example, that could include defining a multigenerational transition for the client as part of a regular review that typically re-evaluates investment concepts, such as risk tolerance. This is essentially an extension of a holistic, client-centered approach to wealth management. Financial literacy is also a key component of this approach. Financial education, when delivered frequently, regularly, and with real-world experiences or examples can stick with an investor and be improved upon throughout their lifetimes. A solid understanding of financial concepts and products can help offset the decline in other areas of intelligence. Additionally, using financial literacy to prepare younger generations to support their parents and grandparents and, later, themselves as they encounter important financial decisions, pays dividends across the generations. Establishing a holistic plan that manages the financial risks associated with cognitive decline is also an opportunity to build trust and deepen relationships across generations. Trust requires empathy—understanding how we all evolve as investors, and the strengths and challenges that unfold as we enter the “Age of Wisdom.” We can empower younger generations by helping them plan for these challenges. We can empower today’s elderly generation by helping them age with dignity and feel a sense of security, purpose, and connectedness. Family members who have felt the helplessness of being unable to shield a loved one from the financial risks related to cognitive decline know deeply the importance of planning ahead and shielding others of the same burden. As trusted partners, advisors can share this wisdom with clients who have yet to prepare, helping them to also safeguard the financial future for themselves and their families. Editor’s note: Please visit https://www.ssga.com/investment-topics/defined-contribution/2016/The-Impact-Of-Aging-On-Financial-Decisions.pdf for a full version of the State Street Global Advisors’ white paper, “The Impact of Aging on Financial Decisions,” which includes acknowledgments, sources, and credits.